Inject more historical intrigue into your games with the best Crusader Kings 2 expansions. 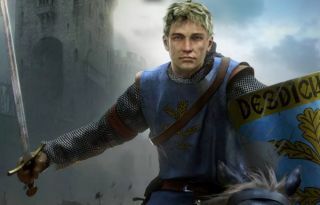 One of the most commonly asked questions about Crusader Kings is “What expansions should I get?” CK2 is six years old and releases multiple DLCs a year. There are fourteen full expansions and a ton of cosmetic DLC, and the complete bundle costs a considerable amount. Let's run down which expansions I think are the most worth your money and why. Most Crusader Kings 2 DLCs focus on a specific religion, culture or government type and are mandatory if you want to play as that kind of empire. Some are more universal and add interesting things for all players. The Old Gods does both, which is why it is hands down the best expansion, and the first you should buy. Paganism is the focus here, but it comes in several different flavours, from the familiar Vikings to West African tribes. Pagans are very strong in the early game, where they can amass large armies and raid their neighbours, but have huge problems keeping their realms together as history marches on. To solve this an ambitious player can ‘reform’ a pagan faith into an organised religion, making it more stable and able to compete on a level playing field with Christianity and Islam. This also makes a great goal for a fun playthrough. The biggest change however, and the reason this remains a top tier DLC even if you have no intention of playing as a pagan, is the addition of a new start date. With The Old Gods installed players can choose to begin the game in 867, when Christianity was less dominant and Vikings prowled the seas. It’s a really exciting period full of interesting characters to play as, like Alfred the Great, who historically founded the Kingdom of England, but has to usurp his useless brother Aethelred first. The 867 start is what transforms The Old Gods from “essential if you want to play as a pagan” to “essential for everyone”. The Legacy of Rome is ostensibly focused on the Byzantine Empire and the Orthodox Church, adding lots of neat little flavour events and decisions, including the ability to mend the schism in the Christian church and restore the Roman Empire. But unless you’re specifically playing as a Byzantine character, you’re most likely here for Retinues. Retinues are elite professional armies that are always active, as opposed to most CK2 armies, which are peasant levies who go back to farming their fields when they’re not fighting a war. As such they form a hardened core to a player’s army and a first line of defense against raiders. Each culture gets its own elite retinue, like English Longbowmen or Bedouin Camel Riders, so they’re extremely flavourful as well as useful. Retinues might seem like a small thing, but they’ve become a core part of the way wars are fought in Crusader Kings and, considering The Legacy of Rome is one of the oldest and cheapest DLCs, they’re well worth shelling out for. Way of Life is focused on the role playing aspect of Crusader Kings, specifically ‘events’, those little ‘choose your own adventure’ pop ups that appear as you play informing you that your ruler has taken up falconry, insulted a priest, or slept with their sister (that last one comes up a lot). How much you enjoy this side of the game will determine whether you pick up this DLC or not, but I absolutely adore them, which is why I’ve rated this so highly. One of the ways Way of Life achieves this is by allowing your ruler to pick a ‘focus’. This gives you a small stat boost and access certain themed events, often improving your skills in that area. For example pick ‘Business’ and you might get an chain of events about funding a trading journey to foreign lands, while a Scholarship focus might result in you building an Observatory. It’s not just fun little stories though, these foci can often have powerful in game effects. The War focus allows you to challenge characters to a duel and kill them in single combat, while the Seduction focus lets you go all Double Indemnity and get a besotted lover to off their spouse for you. It’s all tremendous fun. Like The Old Gods, Charlemagne also adds a new start date, this time even further back in time in 769. 769 isn’t quite as fun as 867, but it’s pretty good anyway, especially as the sun worshipping Zunists still exist. The real fun though, comes for those who own both DLCs, as Pagans are far more powerful in 769. One particularly fun start is Sigurd Ring in Uppland, whose heir grows up to be Ragnar Lodbrok, a Norse folk hero and protagonist of the TV show Vikings. The bulk of Charlemagne though is focused on Charlemagne himself, his descendants (the Karlings) and The Holy Roman Empire. The warring factions of the HRE are a lot of fun to play about with, making this a useful pick up if you ever plan to play a game there. The Karlings, on the other hand, have become a meme in CK2 circles for their tendency to unite against any attacker and then promptly backstab each other and shatter their realms to pieces the moment they’re left alone. Crusader Kings started out as a relatively straight laced historical game, but over the years it’s gotten increasingly silly. The Conclave DLC enabled a Caligula moment where an unstable monarch could fire their chancellor and replace them with a horse. Jade Dragon one upped that with a noble who turned out to have been a bear masquerading as a human this entire time. Meanwhile Reaper’s Due added more fantastical elements with the ability to play chess with death or seek immortality. Consider Monks and Mystics the culmination of this trend, and it’s specifically recommended for those who enjoy the silly side of CK2. Monks and Mystics deals with secret societies. Most of these simply involve secretly practicing one religion while professing another, or joining the scientifically inclined Hermetic Society, but the star of the show is the ability to become a devil worshipper. Worshipping Lucifer (or his non-abrahamic equivalent) will slowly gain you access to supernatural powers like the ability to curse your enemies or heal your wounds, all powered by the sacrifice of innocents and other evil acts. Reach the end of the event chain and you might find yourself giving birth to the antichrist and ushering in a powerful demon worshipping empire. Historical purists may frown, but everyone should play at least one game as a satanist. Each of these DLCs is heavily focused on a specific religion, government or culture. This means that if you want to play as a Muslim ruler, Sword of Islam is mandatory, but if you aren’t then there’s no real reason to buy it. Thus you should pick them up only when you need them. Never buy Sunset Invasion. It may be fun *once* to see a horde of marauding Aztecs arrive from the West and obliterate Europe, but you’ll invariably forget to turn it off and then have one of your more ‘normal’ games ruined by a sudden Aztec invasion.